Chairman of Morton College and Loyola University alumnus Frank Aguilar has no words for the incredible season Loyola Ramblers have been having during March Madness. “This is a great time to be part of the Loyola family, to be part of the alumni because we have been waiting for a win since 1963. So this is incredible. I am beyond excited,” said Aguilar, who graduated from Loyola in 1988 with a degree in philosophy. Currently, Aguilar serves as chairman at Morton College and hopes to bring Loyola representatives to Morton College’s campus to meet with prospective students. “I would love for the opportunity to have students at Morton College meet with Loyola representatives. 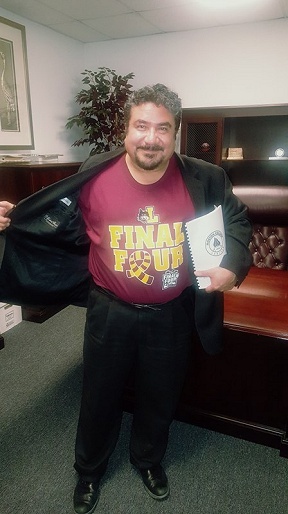 We are dedicated to creating ample opportunities for our students at Morton.” In the meantime, Aguilar is ready to partake in the celebration should the Loyola Ramblers take the NCAA championship. “I am ready and will be watching this weekend.” The Loyola Ramblers will play the Michigan Wolverines on Saturday, March 31st.